Director – John Guillermin, Screenplay – Steve Pressfield & Ronald Shusett, Producer – Martha Schumacher, Photography – Alec Mills, Music – John Scott, Visual Effects Supervisor – Barry Nolan, Miniature Supervisor – David Jones, Special Effects Supervisor – Joseph Mercurio, Creature Effects – Carlo Rambaldi, Makeup – Giannetto de Rossi, Production Design – Peter Murton. Production Company – De Laurentiis Entertainment Group. King Kong survives his fall from the World Trade Center. He he is badly injured and the only hope to save him is to implant an artificial heart. However, there is no available blood supply for the operation. A female Kong is then captured in Borneo. The artificial heart transplant operation is successfully conducted but when the revived Kong smells the presence of a female of the species, he breaks out of captivity. Together the two escape to find love together. However, they are pursued by the military who are determined to hunt them down. There is a certain sector of the genre press that regarded Dino De Laurentiis as the ultimate crass producer. This was a reputation this principally derived from De Laurentiis’s campy remakes of King Kong (1976) and Flash Gordon (1980). It should however be said in Dino De Laurentiis’s favour that his De Laurentiis Entertainment Group was responsible for some quality drama, having bankrolled such productions as Michael Cimino’s epic The Year of the Dragon (1985), the highly regarded Manhunter (1986), and several David Lynch and Stephen King works, while before that back in Italy De Laurentiis had produced such joys as Danger: Diabolik (1967) and Barbarella (1968), as well as various films for Ingmar Bergman and Federico Fellini. Dino De Laurentiis was however also responsible for, in the eyes of many, such turkeys as The White Buffalo (1977), Stephen King flops like Maximum Overdrive (1986), the Amityville sequels and Orca (1977). One tends to believe that Dino De Laurentiis’s good films are more shrewd commercial sense than anything necessarily to do with being a good producer. 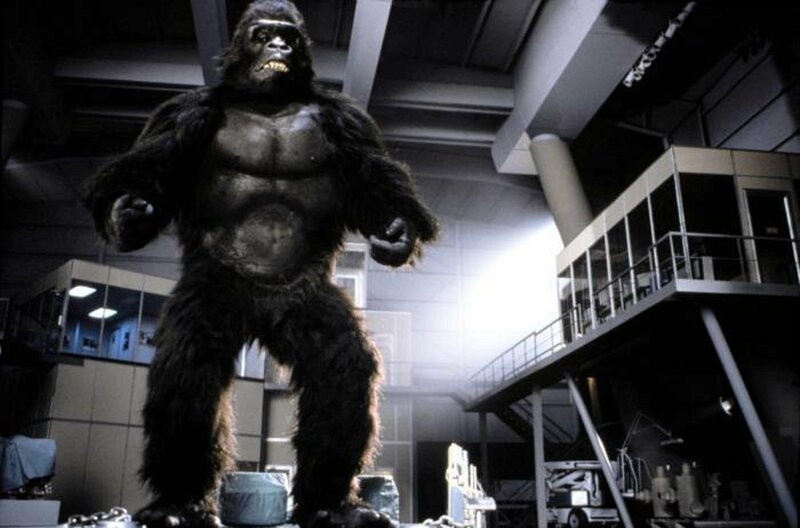 It is however the King Kong remake fiasco that Dino de Laurnetiis will always be remembered for. King Kong was a flop of such colossal proportions that it has been nominated as one of the all-time worst films. It is surely only Dino De Laurentiis who would have the chutzpah to produce King Kong Lives, a $35 million sequel to a film that everybody but everybody absolutely despised. It was even announced at one point (possibly as a press prank) that Dino De Laurentiis was thinking about teaming King Kong up with the whale from Orca. Along with Dino De Laurentiis and director John Guiellermin, the only person returning from the first film is effects man Carlo Rambaldi, the person responsible for that film’s life-size mechanical Kong publicity scam. Carlo Rambaldi has clearly taken to heart the fact that the most convincing ape scenes in the first film were those with Rick Baker in his ape suit and the Kong scenes here are now conducted by stunt-people in ape suits. However, they are unconvincing, lacking in any character, while the apes look unintentionally comical with their glassy eyes.